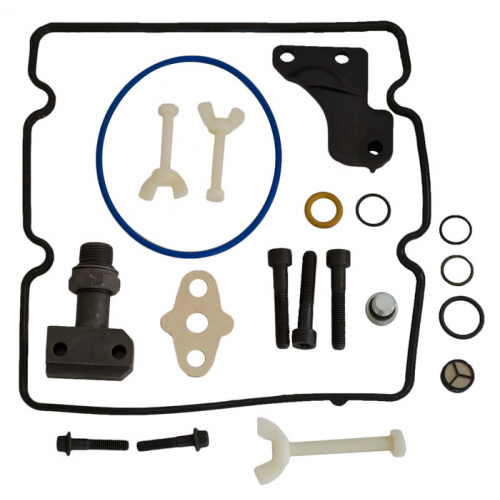 This Kit is designed to replace the factory "snap-to-connect" other known as STC Fitting. 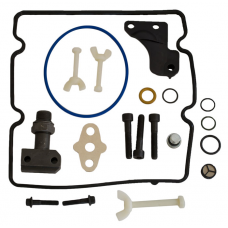 This complete kit includes all of the hardware, gaskets and “O” rings needed when replacing the STC fitting. This new Fitting repair kit has a one piece tube that attaches to the HPOP, designed to never fail. This kit is a must to any 04.5-07 6.o diesel having a HPOP replaced or EGR deleted or updated. If you have already done your EGR delete this is still a great choice to repair this fitting before it leaves you stalled and broke down somewhere. The STC fitting connects the High pressure oil pump to the oil supply branch tube. This is a two piece fitting that has tendency to flex during operation which allows it to flex and wear on the o ring and seal. This causes the fitting to loosen and sometimes even complete separation of the two pieces as shown in the picture above. When this fitting fails the vehicle will no start during operating temps and can even stall out during operation.